Here are the latest news for our Staten Island Real Estate market from Vitale Sunshine Realtors. This report reflects total number of one family and two family homes sold on Staten Island, NY in the first quarter of 2012 compared to same period in 2011, as well as the average sales price of these properties. This graph represents the median sales price for Staten Island, NY One Family Homes sold in the 1st quarter of 2012 compared to the same period in 2011. The average price of One Family Attached homes has slightly increased, by 0.37%, since the same time last year. 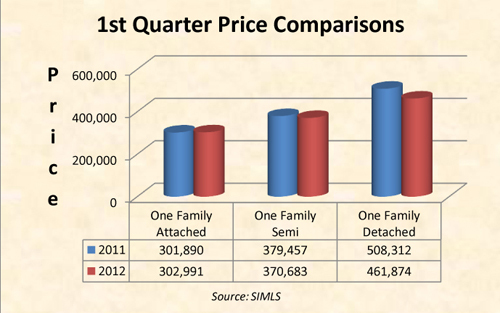 The average price of One Family Semi-Attached homes has decreased by 2.31% since the same time last year. The average price of One Family Detached homes has decreased by 9.14% since the same time last year. This graph represents the median sales price for Staten Island, NY Two Family Homes sold in the 1st quarter of 2012 compared to the same period in 2011. The average price of Two Family Attached homes has increased by 21.36% since the same time last year. The average price of Two Family Semi-Attached homes has increased by 1.37% since the same time last year. The average price of Two Family Detached homes has increased by 6.26% since the same time last year. This graph represents total number of units sold of One Family Homes on Staten Island, NY in the 1st quarter of 2012 compared to the same period in 2011. The number of units sold of One Family-Attached homes has decreased by 23 units since the same time last year. 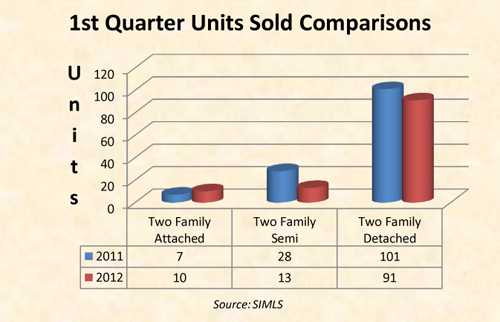 The number of units sold of One Family Semi-Attached homes has increased by 14 units since the same time last year. The number of units sold of One Family Detached homes has decreased by 3 units since the same time last year. This graph represents total number of units sold of Two Family Homes on Staten Island, NY in the 1st quarter of 2012 compared to the same period in 2011. The number of units sold of Two Family-Attached homes has increased by 3 units since the same time last year. 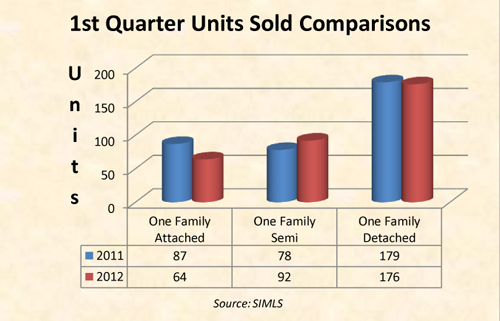 The number of units sold of Two Family Semi-Attached homes has decreased by 15 units since the same time last year. The number of units sold of Two Family Detached homes has decreased by 10 units since the same time last year. 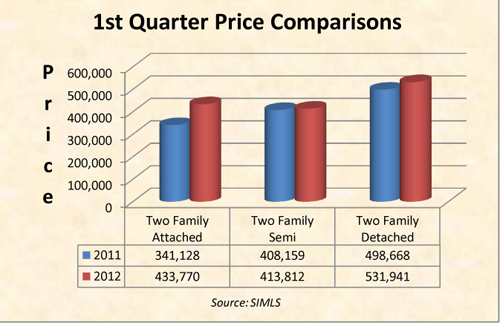 The graphs above represent the most up to date information on home sales in Staten Island, NY for the 1st Quarter of 2012. Kristina Gershteyn is a licensed real estate professional at Vitale Sunshine Realtors. Curious what your Staten Island home or condo is worth? For questions or more information, call me today! (917)363-1508.